7/19/17 - Initial Appearance - $1,000 Cash Bond set. No contact with victim, victim's family or employer. No unsupervised contact with any minors. No possession of any devices that can access the internet. 7/20/17 - Actual bond posted with Sheriff. 7/28/17 - Return on Warrant / Initial Appearance. $5,000 Signature Bond set. 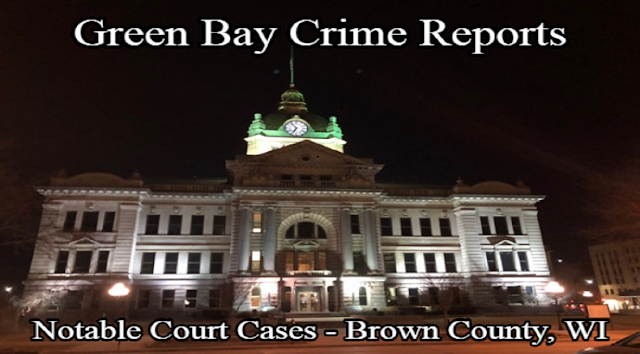 No contact with Alexander K. Follow all conditions associated with Milwaukee County case. 4/24/18 - Arraignment - Not Guilty Pleas entered. 12/26/17 - Initial Appearance - $500 Cash Bond set. Bond posted with Sheriff. 8/18/17 - Initial Appearance - $50,000 Cash Bond set. Defendant to consume no alcohol. No presence in taverns/liquor stores. Defendant not to operate motor vehicle without valid driver license. SCRAM device to be installed prior to release from jail. 8/21/17 - Actual Bond posted with Sheriff. Letter from WI Lock & Load, Defendant placed on SCRAM device. 12/12/16 - Initial Appearance. $2,500 Cash Bond Set. 11/6/17 - Status Conference - State's motion to adjourn trial. Court amends bond. Defendant released. $2,500 Signature Bond set. 2/23/16 - Probable Cause Hearing. Defendant in Custody. NO BOND. 10/4/17 - Initial Appearance - $25,000 Cash Bond set. 1/2/18 - Defendant pleads Not Guilty to both counts. 1/16/18 - Initial Appearance - $1,500 Cash Bond set. 3/30/18 - Arraignment - Defendant pleads Not Guilty on ALL counts. 6/28/12 - Return on Warrant / Initial Appearance - $5,000 Signature Bond set. 2/9/18 - Return on Warrant - $10,000 Cash Bond set. 2/17/17 - Initial Appearance - $50,000 Cash Bond set. No contact w/victims. 7/25/17 - Motion for Modification of Bail. 3/2/18 - Initial Appearance. $30,000 Cash Bond set. No contact with victim or Speedway Gas Stations. 4/30/18 - Order for Examination Under 971.16 (Not Guilty by Reason of Mental Disease or Defect).